Can you imagine making your own road? You get to decide how long or short the road will be. The road can be a straight shot. Your road can have tons of curves with twists and turns. 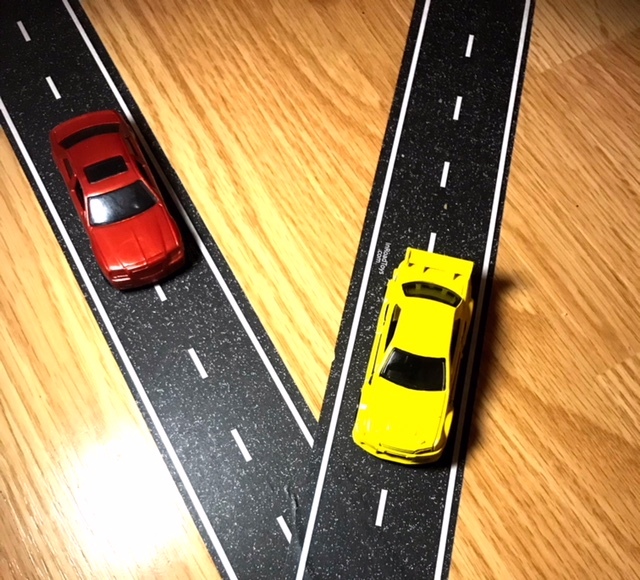 With PlayTape, you can create whatever type of road you want for all of your vehicles. PlayTape is just what it sounds like. It is a tape that looks like a road or rail that you stick to a flat surface. To remove it, peel it up from the flat surface. No residue is left behind after peeling it up. 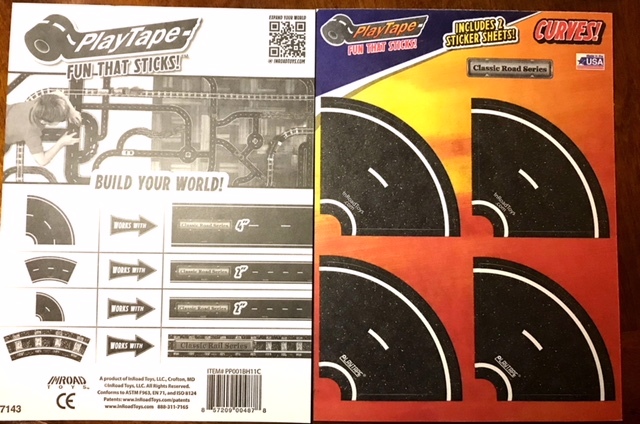 PlayTape was made-to-scale to fit most popular trucks, cars, and trains. It has revolutionized the way the world plays with toy vehicles. I really enjoy that this allows your children to be creative. My son is a huge fan of PlayTape. Not only does he like using it to put his cars on, but he uses his action figures as pedestrians on the roads. Sometimes he puts little play trees or small branches on the side to make it look a real highway. Portable – easily stick it in your pocket or diaper bag (made for ages 3+). Allowing racetracks to be built anywhere & everywhere. Repositionable – quick and easy to do by tearing a piece. Curves – Curves are available to add some fun to your road or rail. Available in other colors – black, blue, red. Continuous Fun – you can always change your mind and change the shape, length, add curves, color, etc. Safe and Easy – no scissors or knives are needed. Non-toxic. Meets all U.S. and International child safety standards. Can be used on walls too! PlayTape has won over 25 industry awards, including Parents Magazine Best Toys of 2014 and being named a 2016 Toy Industry Association Toy of the Year Finalist. Their products are made in the United States. It is available at Walmart, Amazon, and on their website. If you are looking for a toy that challenges your children to use their imagination, then PlayTape will make a great product to try.